John Blazy blends professional furniture-making craftsmanship with a knowledge of chemistry and plastics to address boatbuilding challenges. 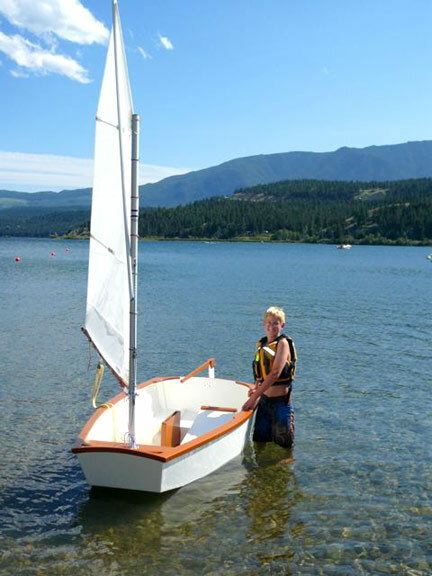 His inspiration to build a boat started with a strong desire to see down into the water. He wanted to see the aquatic life and terrain he leisurely passed over. Working from this perspective he designed CALYPSEE, a 14 ft. launch with three underwater viewing ports, two in the bow and one larger port in the cockpit floor. Additional requirements included: low cost, one year building cycle, trolling motor power plant, and the aesthetics of the old mahogany Chris-Craft runabouts. His love of viewing ports began with his first boatbuilding effort, BUBBLE BOAT. It was essentially an open wooden box with a ¼” Lexan panel across the bottom. The box was collared by a large inner tube which supported it in the water. Plywood panels atop the inner tube served for seating. John sat with his feet in the box and viewed the underwater world as he trolled with an electric motor. The fun he had with this makeshift boat inspired him to build a serious bottom viewing boat. John built a paperboard 1” to 1′ model of CALYPSEE and cut and trimmed the panels with scissors until he got it to his liking. He then carefully un-taped the panels. By overlaying the panels with a piece of clear mylar into which he had scored a grid, he was able to read off and compute the dimensions for the full size plywood panels. John cut the hull panels from ¼” Super-Ply, a three ply exterior glue plywood composed of a douglas fir core and two thick luan faces. The topsides are sheathed in 4 oz. fiberglass cloth and the bottom is covered in 32 oz biaxial fiberglass cloth with woven chopped strand. The viewing ports are cut from MR-10 Lexan which has a very tough scratch resistant coating on one side. The viewing cutouts are reinforced with an aluminum flange on each side of the hull panel and are screw tapped into each other. A layer of PL Premium caulk on each side of the Lexan window sealed it into place. As John’s presentation unfolded, it became obvious that here is man with a creative imagination willing to try an innovative approach. He had a “Eureka” moment when he discovered that a scrap of polyester film, used as a barrier to keep a scarf joint from sticking to the clamps, did not stick to the epoxy. What’s more, it left a perfectly smooth, clear finish. He upsized the idea and applied it to the epoxy coating he planned for the topsides. He cut a piece of 30 mil polyester film to the full size of a topside panel. He rolled epoxy on the panel and then unrolled the polyester film atop it. Using a four inch hard rubber roller, he carefully rolled the film into the epoxy and smoothed the epoxy evenly beneath the film. When he removed the film after curing, he had a blemish-free, high gloss finish that required no sanding. John created an innovative technique for gluing wood, end-grain to end-grain. He first heated the end grain of each block with a heat gun to thoroughly drive away moisture and enlarge the cell structure. As he applied the epoxy, the wood easily wicked the epoxy deep within. He kept adding coats until the wood could absorb no more and a thick layer formed on the ends. He waited until the glue started to kick and then jammed them together and clamped as necessary. He said he got very strong joints. He used this technique to join non-structural pieces. John also discussed a technique for cutting multiple ‘V’ shaped kerfs used for bending wood. Unlike a rectangular kerf, a ‘V’ kerf seals itself as the wood is bent, leaving no void to be filled. The key to the technique is grinding the teeth of a circular saw blade into a ‘V’ cross-section. You better e-mail or call John directly if you want to know more. CALYPSEE’S signature is a ribbon stripe mahogany deck John glued in place from hand-trimmed veneers. A coat of epoxy and a coat of Minwax Helmsman Spar Varnish (HVLP sprayed) created a glasslike surface. Greeting the world like a premature baby, CALYPSEE was launched last summer before she was completely done. The stern deck and a number of cockpit trim details still await John’s attention. But the batteries are charged, the trailer is ready, and CALYPSEE is ready to explore wherever clear water beckons. PS. John recommended McMaster Carr as a resource for a myriad of hardware items.